Great day today! 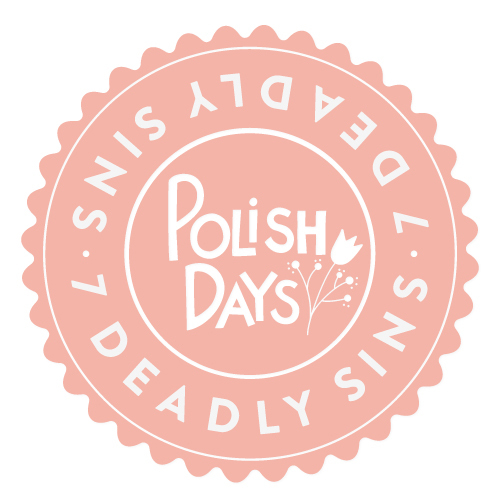 I'm participating for the first time at a Polish Days event. I think it's such a wonderful project and it's so much fun because you never now what the next months' theme will be. So I can't wait to see what's next! ^^ But until then, the topic of this month is 7 Deadly Sins. I'm so glad I did this manicure last week 'cause now I have the flu so I'm not really in the mood to paint my nails. Anyways, with this manicure I think I wanted to represent lust or even greed because of the golden touch. So first I've painted my nails with a dark red shade then applied the golden polish with the saran wrap technique. Hope you enjoy it! Hey there!! I wanted to let you know that I nominated you for the Liebster Award. I love your blog and wanted to let others know about you. You can nominate others if you would like! Thank you very much! wow this looks stunning, contrast of colours is beautiful. I love the saran wrap technique, simple but always works. Foarte frumoasa combinatia si tema aleasa. Super. Pupici.